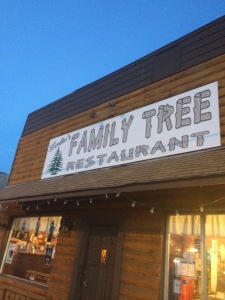 Leslie’s Family Tree Restaurant is a third-generation, family run restaurant which consists of two buildings that sit side by side. The building to the east which houses the restaurant is the younger of the two structures. This portion of the establishment used to be the Santaquin Post Office and later a floral shop; it now has a friendly, rustic log cabin feel. The building to the west is a lot older and has been around for over a hundred years. Throughout its history it has served as a restaurant, garage, bar and billiards parlor, bus stop, bomb shelter and illegal gambling venue. Group was informed of a vortex in the older, east portion of the restaurant. This area yielded the majority of activity through the night, and several investigators reported being able to feel the presence of the vortex. At one point in the evening, Brandy, the group medium, witnessed dozens of small creatures exiting the vortex and flooding into the dining area. At this time there were reports of hair pulling and the creatures playing with toes. There were various other entities present: a young boy and woman (both under the control of a demonic entity from their description provided by Brandy) an angry man that goes by the name “Patrick.”, and a demonic entity in the basement that had taken on the guise of a little girl holding a doll. Several EVP’s were captured, some class A but most of lesser varying degrees of clarity. At one point, a small group made their way to the basement of the building but was quickly instructed to leave because of the looming, dark presence of the demonic little girl. While in the basement investigators complained of being light headed. Occasionally, noises were heard of metal clicking on metal emanating from the kitchen area. A few faint audible EVPs were noted by several investigators. In the west portion of the restaurant, the main dining area, a Native American skin walker is known to haunt around the bathroom area. Tim “Beaker” captured IR and UV spectrum video footage of different locations throughout the building; results of his data can be found in our media section under videos. In general, a fairly active site, though this particular evening the paranormal activity seemed rather subdued and latent considering that there have been reports of chairs being stacked upon tables and objects being moved across rooms. Given the nature of the vortex, and the demonic entity controlling other spirits from the basement this haunting can be classified as a negative haunting.